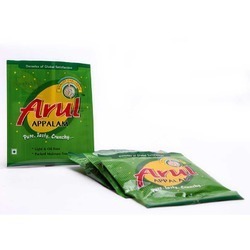 Serving the platter with loads of taste and health, we are amongst the frontiers, engaged in manufacturing and processing hygienic Appalam Papads. The variety that we have in store is complete vegetarian and natural devoid of any added preservatives or colors. Appalams that we process in our hygienic processing facility are rich in proteins with 0% Cholesterol and 0% Fat. We offer a large variety to suit our client's taste buds and invite inquiries’ for placing orders with us. 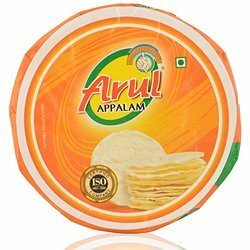 We manufacture and process unmatched quality and delicious mini Mini Papad which is a lip-smacking delicacy, a crunchy wafer that can also be used as a side dish along with the main course. Rich in protein and other nutrients, all our appalam products are free from artificial colour and flavour. We welcome queries for Appalams & Pappadams from Overseas Countries like United Kingdom, United States, Australia, China, Denmark, France, Netherlands, New Zealand & Norway. A crisp and very delicious snack, this Black Pepper Pappadums is used both as starters and side dish to add that extra pinch of taste and flavour to the meal. Also, available in circular discs, these can be broken diagonally or quarterly for easy frying in little oil. An appropriate mixture of urad dal, rice flour, black pepper, salt, calcium carbonate coconut oil, these pappadums are crunchy and delicious enough to be liked by every person. 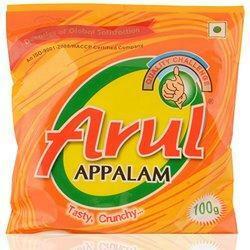 Arul Madras Appalam is the most demanded and fast selling product of our company. Arul Appalams carry with them, a legacy, and that legacy needs to be upheld in every grain that goes into the making of this signature product. Our pappadums are naturally dried in the sun so that natural flavours are retained without attenuation. And who needs artificial colours and flavours when the natural flavours are aplenty!? 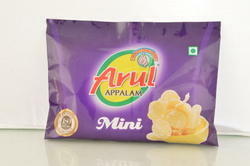 Arul’s Appalams are 100% Vegan, and it makes these crispies fit for every platter. Our utmost commitment to quality and authenticity makes our Applam ideal for all kids… from ages 2 to 90! Our already-awesome Applam is interspersed with some more elements of awesomeness - natural added-flavours that take our pappadums a cut above the rest… or a crunch above the rest. Leveraging on our ancient old heritage of finely sorted and blended spices, we bring forth a mouth watering variety of Indian Mixed Masala Papad/ Pappadaum that are carefully made blending various variety of Indian masalas together. 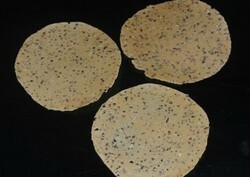 Made using traditional techniques of pappadum making, these are sure to offer the authentic traditional taste. Presenting to our clients, a very mouthwatering delicacy, the famous Appalam Supplier, which has earned the favours of many likers for lip-smacking taste and quality. A pinch of chilli and a tinge of garlic, present in these appalams give them a unique flavour and taste that is unforgettable. Clients may place an order with us for the desired quantity and we ensure to satiate their requirement within a stipulated time frame. We welcome queries for Appalams & Pappadams from Overseas Countries like the United Kingdom, United States, Australia, China, Denmark, France, Netherlands, New Zealand & Norway. Our variety of Garlic Appalam/Poppadom/Papad is very popular for its garlic rich taste that is just perfect, neither too high nor too low. 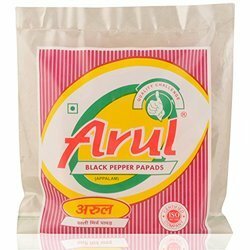 Black Pepper Papad/Appalam/Poppadom is the most demanded variety of Appalam that we have on offer for our clients. This tastes a little tangy soothing the tongue with the bitterness of pepper that is sure to leave an everlasting taste. Processed in utmost hygienic conditions, the appalams that we offer ensures quality. 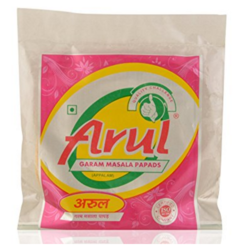 We offer a wide variety of Garam Masala Papad that is very tasty and ensures quality as well Ensuring delectable taste, these can be made available from us in different variety at cost-effective prices. 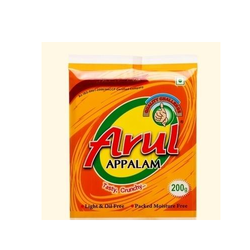 Our range of Arul Appalam is the most demanded as it is processed in utmost hygienic conditions, and hence assure quality. Guaranteeing utmost satisfaction to the consumer for its taste and aromatic flavour, these are available to our buyers in safe packaging at competitive prices.